EveryBlock on Tuesday launched the “EveryBlock Publisher Program” which allows website owners to claim their local news sites within the network. 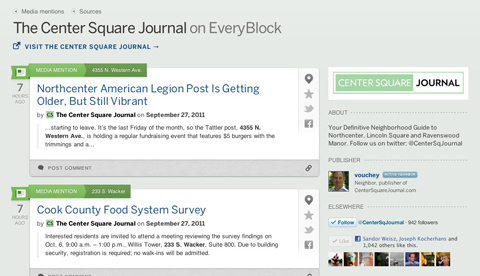 Once claimed stories are shared through EveryBlock.com while site users can interact with stories and share their favorites using social media. Publishers will instantly beome part of the “media mentions” section of EveryBlock which notifies followers when stories have been placed on the site in regards to a certain geographic location. You can claim your site by clicking on the name of your publication in the media mention section and then following the verification steps. Add links to your Facebook and Twitter accounts to help you grow your fans and followers. These links will show up next to your articles on EveryBlock, and if someone shares one of your articles from EveryBlock on Twitter, the tweet will include your Twitter handle. Upload a logo, which will appear on all of your media mentions to increase the visibility of your stories and build greater awareness for your publication. Auto-subscribe to all your media mentions on EveryBlock, which means you’ll get an e-mail whenever somebody comments on one of your stories on EveryBlock — so you can engage with neighbors who are interested in your stories. Manually tell us to refresh your feed so your latest news is posted sooner. Right now we check each media source for updates once an hour, but if you’ve just published some breaking news, this lets you tell us about it more quickly. EveryBlock officials have revealed that more features will be arriving for the program over the next few months although they have been tight lipped about what those features might include. Give the EveryBlock publisher program a try and let us know what you think.